The Little Sisters of the Poor and residents of Holy Family Residence celebrated the feast day of St. Jeanne Jugan, the mother foundress of the Little Sisters of the Poor, with a host of activities on Wednesday, Aug. 30. The day began at 10:30 a.m. with a Mass celebrated by the Most Rev. Joseph C. Bambera, D.D., J.C.L., bishop of the Diocese of Scranton, along with several other diocesan priests, in the chapel at Holy Family Residence, 2500 Adams Ave., Scranton. Following the Mass, the Bishop, residents, and friends enjoyed a home cooked luncheon. For more information on helping the Little Sisters, please call (570) 343-4065 ext. 3144. First Row: Sister Therese Michel, l.s.p. and Sister Kathleen, l.s.p. ; Second Row: Sister Alice, l.s.p. ; Sister Laurelliya, l.s.p. ; the Rev. E. Francis Kelly, chaplain; the Most Rev. 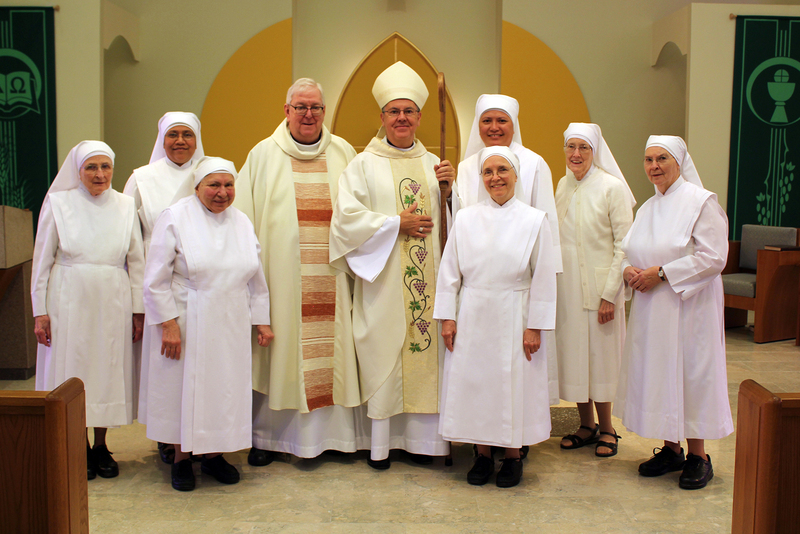 Joseph C. Bambera, bishop of the Diocese of Scranton; Sister Theresa Louisa, l.s.p., superior of the Little Sisters of the Poor’s Scranton community; Sister Mary Augustine, l.s.p., and Sister Marie Therese, l.s.p.